There are so many concrete surfaces being facilitated in this new era of modern design and decor it’s almost too many to count. Concrete is being used in the most obvious areas such as driveways and walkways, but now design has brought it into other beautiful areas even in homes and restaurants as countertops and stamped on walls and walkways. With such different uses for concrete, it is important to make sure they have a concrete sealer. Several of the casinos here in Las Vegas also boasts unbelievable large square foot areas of stamped concrete. They have definitely found that the stamped concrete, with the correct concrete sealer in place, is much more efficient to keep clean and much less maintenance than the old-fashioned crazy carpet they used to place in their casino floors. I’m sure all of you that have been here in Las Vegas for any period of time remember that stinky cigarette smoke filled obnoxious designed carpet on the floor…..heck if you go to the older casinos….it’s still there! Smooth concrete surfaces and stamped concrete surfaces are not only very popular but very economical and easy to maintain as well. It is extremely imperative that both the smooth concrete surfaces and stamped concrete surfaces have the appropriate concrete sealer. Concrete is now a stable in new construction all the way from new home construction to the hospitality industry. Recently, concrete countertops are being manufactured for an extremely modern look that is very appealing to the new minimalistic décor that is highly desired these days. Concrete is an awesome product. It’s easy to manufacture and can be easily colored, dyed or stamped to accommodate any designers palette. Concrete is made of several delicate minerals depending on the surface that you are wanting. Being that said, concrete is being used on so many surfaces and so many areas, it is important that the concrete sealer is properly applied to prevent wear and tear and keep it lasting for a very long time. 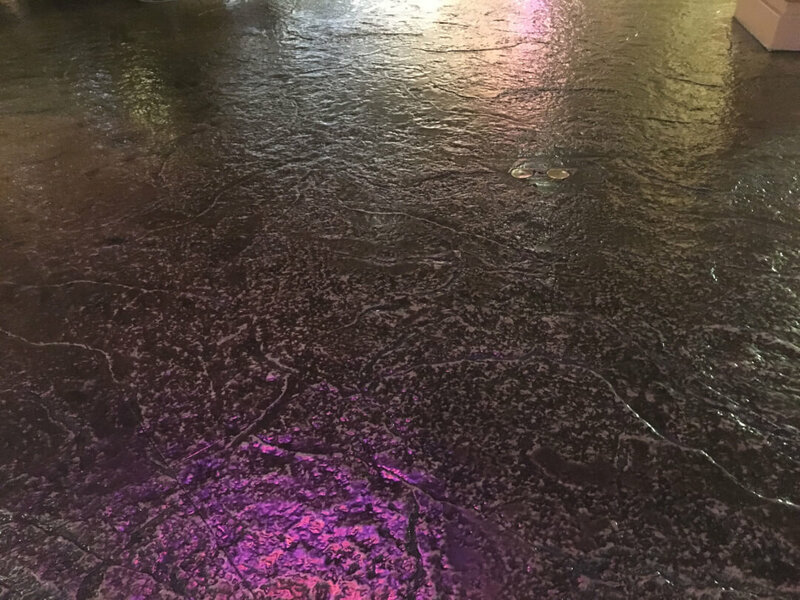 Obviously, here in Las Vegas, if you are going to have an outdoor surface that is going to utilize either a plain concrete surface or a stamped concrete finish – it will be critical that the correct sealer is placed on the product to protect it from our harsh desert elements and high traffic that it may endure. Typically, concrete and stamped concrete product is used in high traffic areas in both residential and hospitality areas. Concrete is not just affordable and beautiful but it truly serves a great purpose when properly sealed. With the appropriate concrete sealer on any surface (we also do paver sealing), it can withstand major water leaks and grease spills and oil and tire tread from vehicles. Sealed concrete can handle major disasters and actually be easy to clean up versus more fragile products such as wood or even tile. Concrete, properly sealed, won’t break, chip or crack and can actually last a lifetime. In the more heavy traffic areas and commercial areas, sealed concrete can be easily cleaned and it is very easy to reseal concrete after a proper removal process. We are proud to let our customers know that not only are we the experts in putting a concrete sealer on your concrete or stamped concrete product, but we are also the authority in replacing your older concrete sealer. We have a professional staff that will handle the large task of power spraying and removes all of the current sealers that are on the concrete. We will then let the surface completely dry and then prep it to ensure a proper seal. We specialize in any area that you need to be done whether it be a small patio, a medium size driveway, or even a large HOA community or commercial area. We can accommodate even the largest hospitality jobs that you may have. Call us today so that we can get you a free, no strings attached estimate today. We are the leaders in concrete sealer products industry here in Las Vegas and have a variety of finishes for you to choose from. You can have your concrete sealed with everything from a matte finish to a semi-gloss, all the way to the extreme shine surface that will make your concrete area look like it is almost liquid. Las Vegas Sealing is your expert for all your concrete surfaces.